The cottages are at the heart of the farm and the dairying and cheese making activities go on very closely by. Visitors are welcome to watch and see what goes on. The cows are milked in the early morning and again in the afternoon. Cheese is made daily. The cottages will especially appeal to those who want to experience a little of the life and environment of a working farm. But if cows and tractors don’t appeal, Tobermory is just minutes away. All have been recently re-furbished to a very comfortable standard. They are heated from the farm’s log burning boiler and also have their own wood burning stoves. All are equipped with TV./DVD/and have internet facility. Clothes washing facilities and a drying room are available. 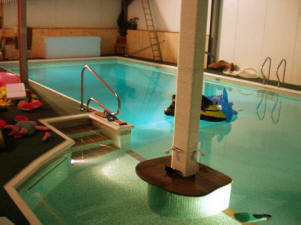 Visitors are invited to make use of the farm’s heated indoor swimming pool and sauna. The farm is fully self sufficient in its energy needs. Water power from our turbine on the Tobermory River generates our electricity and timber from the forests of Mull produces whatever extra heat is needed to supplement it. When you return home with your happy memories there will be scarcely any carbon foot print left behind to show you were here!